Life has been going well since I have moved to Portland even though I have not found a job yet. I have enjoyed the time I have spent with my family here. I normally visit my sister and Laura once or twice a week. Once in a while I go over and visit my oldest niece Jessica and her husband James. 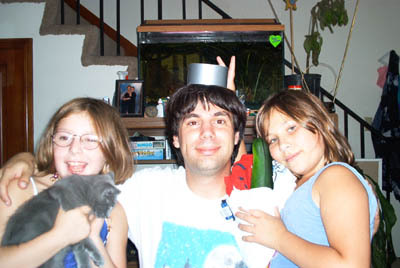 This week (October 1st 2002) I went to school with my youngest niece Laura. She is in the 3rd grade now. I helped out with some stuff in the classroom and got to meet one of the two teachers she has and see what a typical day for her looks like. Sometimes Laura and some of her friends will come over here to swim in the pool, play video games and watch movies. Life here at home with Aga is also going well. 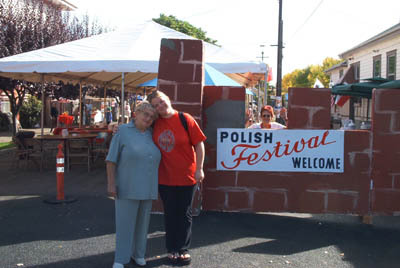 Her Aunt came to visit from Poland last weekend (September 28th and 29th, 2002) and stayed with us. 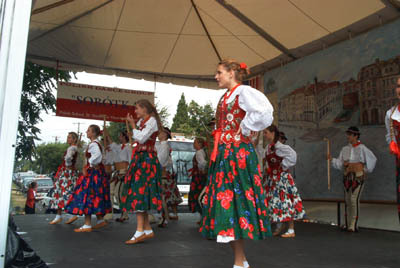 We went to the Polish Festival here in Portland. It was the 9th annual one. There Aga and I helped with the kid's area. 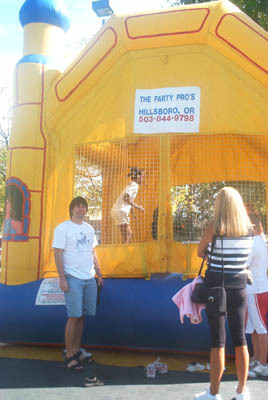 I helped by taking tickets and watching the kids when they went into an air filled little room they could bounce in. 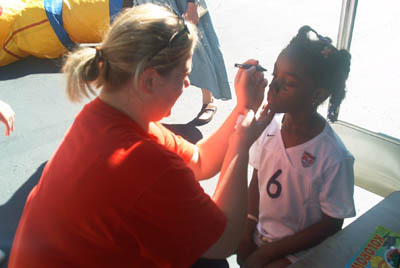 Aga helped out by doing some face painting. 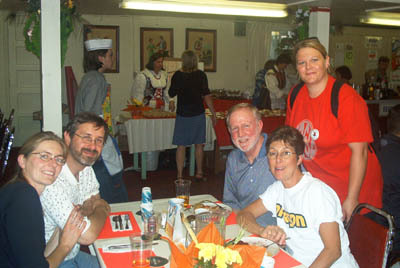 I also got to try out some different Polish foods there as well as see some Polish dancing from the different regions of Poland. There was also singing and dancing there. 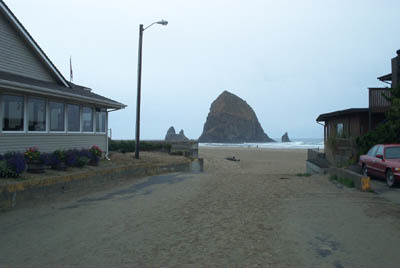 Aga and I have gone to Cannon Beach several times since I have arrived here. On one trip we brought Laura along and on another we went with Jolanta and Voycheck (Friends of Aga - a Polish version of his name is: Wojciech). We also went a few times on our own. 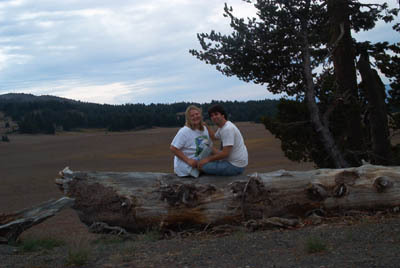 Sometimes we would bring Polish sausage and the ingredients to make smores and build a small fire on the beach out of driftwood. 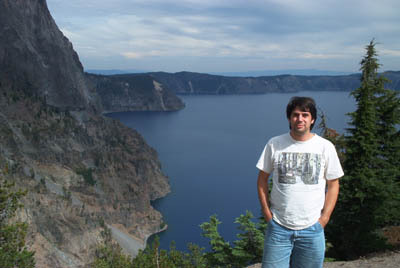 On the weekend of September 14th, 2002 Aga and I went to Crater Lake. This is about 4 hours southeast of Portland. 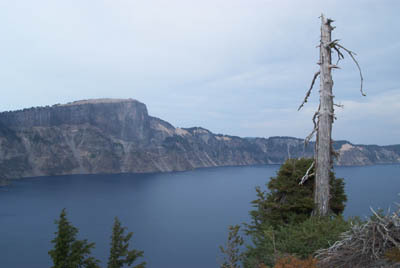 It is the deepest lake in the United States. It is close to 2000 feet deep. 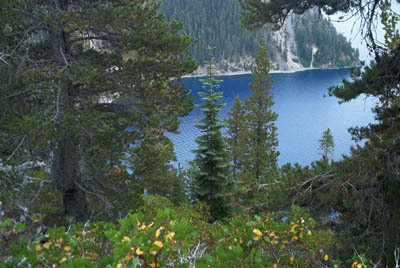 It is also one of the lakes with the best visibility through the water. The color of the water is a very deep blue color. It is similar to that of the color of Cobol Bottles. On the way there we drove past the edge of where some of the forest fires were in this state. The color of everything was different then normal due to the sun shining through the smoke in the air. It was a color I had never seen before and kind of left one with an eerie feeling. I even saw one tree that was still on fire a little bit, but the fire was mostly out. On our way back there was no more smoke and it was completely out. 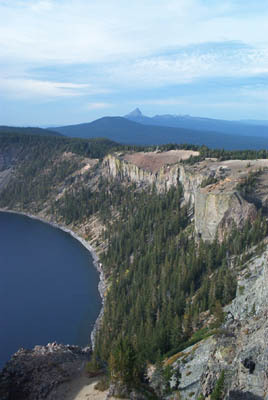 Once we arrived at Crater Lake we stopped at a viewpoint where we could look down at the lake and see Wizard Island. From there we drove to the only spot where you can walk down to the water. It was about a 1.1 mile hike down to the water. We were too late to catch a boat tour and ride to Wizard Island, so we decided to come back the next morning (Sunday). We sat on some rocks for a little while looking at the lake. 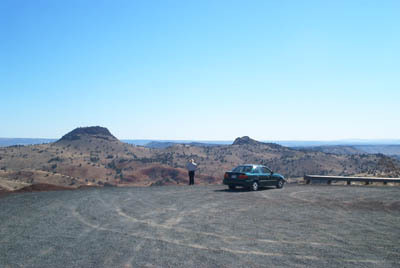 Then we did the 1.1 mile hike back up to the car. In the guide they said it was like walking up the stairs of a 69 story building. After that we drove around looking for a spot to camp for the night. The first spot we checked out had 14 sites to set up tents, but they were all taken. So we went to the other spot they had campsites set up and they had plenty of room. Aga and I set up the tent and then went for a walk and watched the sunset from a cliff overlooking a valley. Once back at our campsite we started a fire and had dinner. The next morning we packed things up and headed back down to the lake to catch the boat tour and check out Wizard Island. We got there a few hours before our boat would leave so we sat on the dock for a while and watched the chipmunks. At one point a chipmunk actually jumped up on my leg and put its two front paws on my hand looking for some food. It was a warm day so I decided to jump in the lake. When I asked the guy how long it would be before the boat go there he suggested I swim while I wait. I think he was just joking and did not expect me to jump into the water. I changed into my swimming suite and jumped in off the dock. 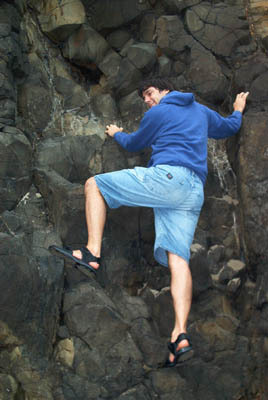 I only stayed in the water a couple of minutes before climbing back out since it was so cold. It definitely felt refreshing. 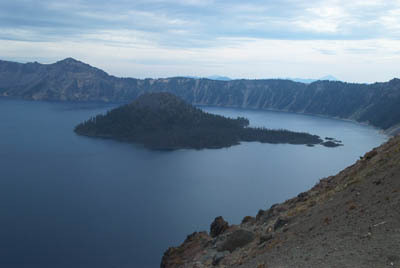 On the boat tour they told us lots of kewl information about Crater Lake. 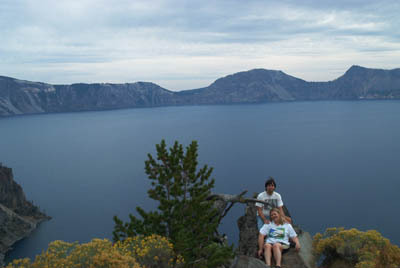 Once they dropped us off at Wizard Island, Aga and I hiked up to the top where we could look down at the crater at the top of the island. Then we hiked back down to catch the boat back to the main land. We were very lucky in that this was the last day of the year that they did boat tours and we were also the last tour group to leave Wizard Island for the year. 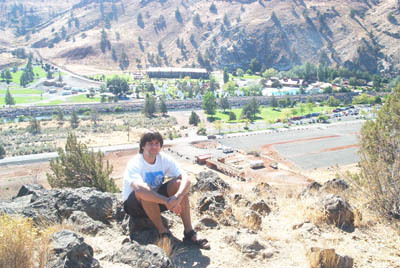 On September 22nd, 2002 Aga and I went to Kah-nee-ta (an Indian Reservation). 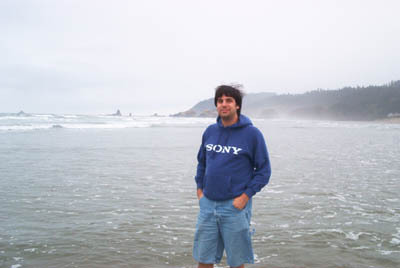 It is truly amazing how the landscape of Oregon changes as you go east. It changes from lots of trees to desert. It felt like I was back in Arizona. 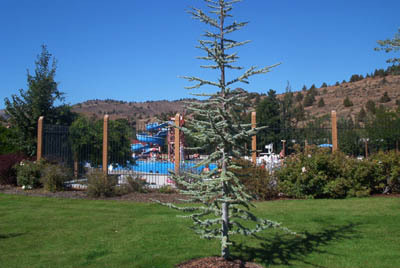 We went to the warm springs they had there. They had a very large swimming pool there that they feed the water into. 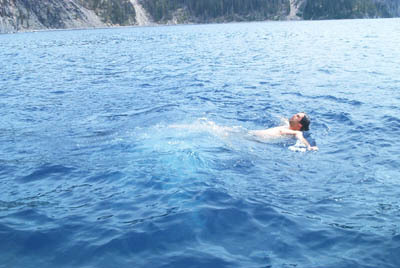 The temperature of the water was around 91 degrees Fahrenheit. They cool the water some before putting it in the pool so it is not too hot. They are open in the winter and they get snow there. That time of the year they don't cool off the water as much and let the temperature in the pool go up to 98 degrees Fahrenheit. 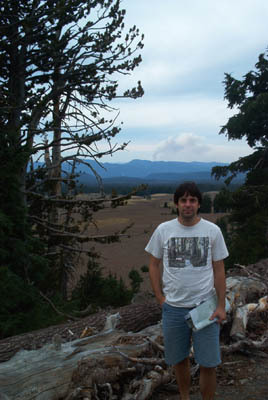 They also had some trails at Kah-nee-ta. Aga and I hiked a little ways to get a nice view of the area. 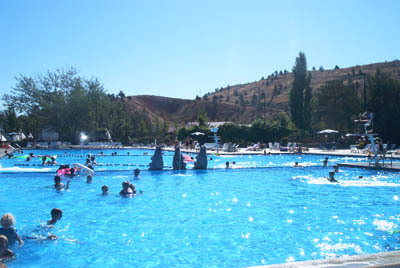 I think it would be kewl to go back there in the winter and go swimming outdoors in the hot water during the winter when there is snow on the ground.